How Much Does It Cost and Where/When Can I Buy It? 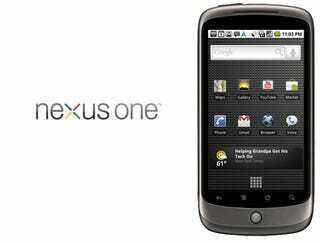 UPDATE: Reader Ryan points out that if you buy an unlocked Nexus One, you should be able to sign up for a non-contract "Even More Plus" plan from T-Mobile. This offers the same 500 voice minutes, unlimited messaging and unlimited internet as the above contract plan, saving you about $150 in the 24 month long haul. Oh, and you can get it custom engraved. The web store is launching today in the US, and will be shipping to test markets: UK, Singapore and Hong Kong. The Nexus One is just the first phone Google's selling with this new model, with more phones, operators and countries coming in the future. Yes, but you won't get 3G, because it only supports the bands for T-Mobile's 3G in the US: UMTS Band 1/4/8 (2100/AWS/900) and GSM/EDGE (850, 900, 1800, 1900 MHz). A really fast 1GHz Qualcomm Snapdragon processor, with a 3.7-inch, 480x800 AMOLED screen. The camera's 5 megapixels with an LED flash—it also shoots MPEG-4 video with one-click YouTube upload, which should be quick over its wireless N Wi-Fi. The trackball's got a multicolor LED for different notifications, and of course it's got a compass, GPS, stereo Bluetooth, 3.5mm headphone jack, two mics for "active noise suppression," light and proximity sensors, and an accelerometer onboard. It's got a 1400mAH battery, from which they promise 5 hours of 3G browsing and 7 hours of 3G talk time. Oh, it's skinnier than a #2 pencil. And did we mention Android 2.1? And Flash 10.1? It's basically a much sexier, more polished Android 2.0, which is on the Droid. We've got a visual guide to Android 2.1, but some highlights: You have things like five screens for homescreen panels and Live Wallpapers, which are basically backgrounds you can interact with. There's a revamped 3D photogallery, which pulls visual tricks like having photos zoom out when you tap an album, and load on a 3D plane when you move the phone around. And, galleries are now background-synced to Picasa. Voice is even huger: Every text field is voice enabled, so you basically never have to type anything. Voice might turn out to be the biggest thing in Android 2.1, actually. Well, besides the fact you'll soon be able to install apps to the SD card, at last freeing Android of the internal ROM app limit. There's also a new 3D framework that lets it do those fancy things like those interactive backgrounds, a new whizbang 3D photogallery app, and a refreshed, zoomier app launcher. And, we'd guess, better graphics in games. Explains a lot of the zippier, lag-free performance we noticed in our hands on, too.